Hello, can someone help translate this for me? Someone in my town got something somewhere and she has no idea what it means, as i can only read a tiny bit I'm of no help to her, can anyone translate this at all ? Ok I did a lot of Googling and it seems that a "實用新案" is a type of Japanese patent that is called a "utility model" in English. There is a legal distinction between "patents" and "utility models" which I don't fully understand. 登錄 means "register," so perhaps it refers to the registration number for the utility model. 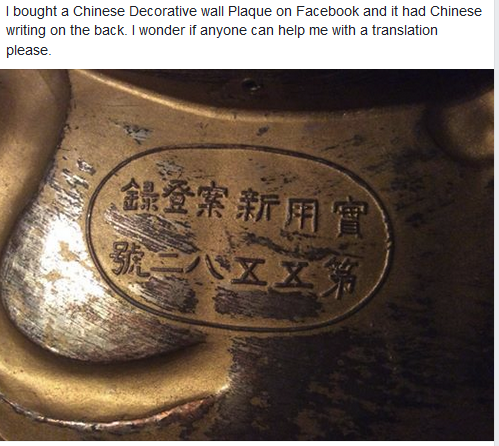 Another interesting thing is that the plaque is written in Traditional Chinese characters, not Japanese Kanji which would have been "実用新案." So maybe this item was made during the Japanese occupation of Taiwan.